With six goals on aggregate, it’s difficult to imagine a scenario where we leave Skopje empty-handed. I think everyone involved expects Milan to be the red and black team of these two included in the draw on Friday for the Europa League Group Stage. However, literally anything can happen in 90 minutes, and going to Macedonia and playing in their almost-home stadium, they have to believe there is still a chance. Milan have to be prepared and be vigilant to hold their lead, and it never hurts to score some more to be safe. We need to not resist the urge to be cocky and simply hold out. Last week, Shkëndija offered very little resistance, hence conceding six goals. But I am going to guess that they may have been a little star struck at the San Siro with 40,000 fans. Perhaps they were confused by the fans who were wearing their colors, but cheering for Milan. Or, the most likely and obvious reason was that they were just out of their league. But I had heard good things about this team, and they had won in all three qualifying rounds ahead of facing us. This week, though, they will be hosting us in the Telekom Arena in nearby Skopje. There will only be a maximum of 33,000 fans this time, but most of them will be cheering for Shkëndija this week. And they are coming off of a 3-0 win over Shkupi in the league on Monday. For that match, Osmani lined up: Jovanovski; Cuculi, Murati, Alimi, Polozhani, Todorovski, Totre, Hasani, Vujcic, Ibraimi, and Stenio Junior. I could not find any injuries or suspensions, so Osmani will be able to play his best 11 if he chooses to. 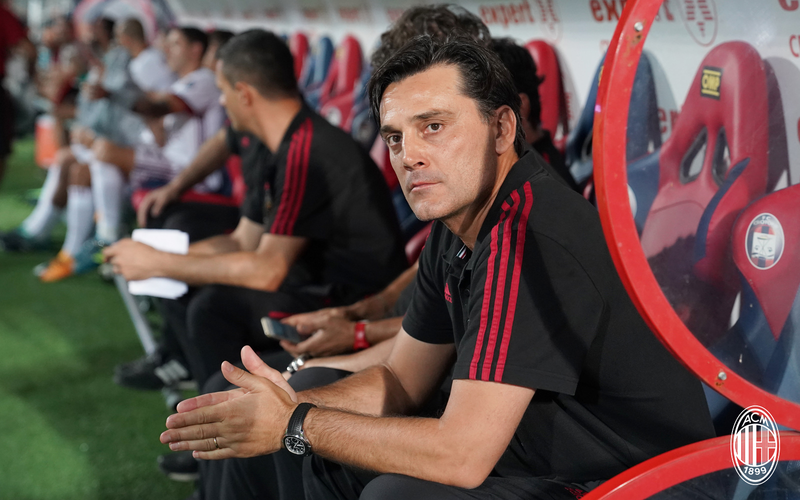 Montella will likely rotate some players again. It’s hard to know how many of his starters he’ll play given the goal advantage that Milan have coming in. Serie A has to be the top priority, given that we have the best chance of achieving Champions League qualification this season in the league. And with us hosting Cagliari on Sunday, he will have to rest some starters for that match. But it is disrespectful to lineup a bench squad even if it’s “just” a Europa League playoff match. And fans are going to want to watch our starters in action, too. Of course, Montella will be without Biglia and Bonaventura due to injuries. And Montolivo may be “rested” due to using too many muscles. (I think he is still in shock from his Apocalyptic brace-scoring last week.) Kalinic, our new signing, is unlikely to make the trip, but rather wait until possibly Sunday for his debut. Niang has presented a medical certificate excusing him from training (a now common practice when anticipating a transfer,) and Paletta, Gomez, and Sosa may be left home as there are transfer talks for each of them, as well. Montella has consistenly only been calling up 20 men, too, so we’ll see who makes the trip when callups are announced. It’s cocky to say that this is an easy game. There are never truly any easy games, and the team that takes even a 6-0 aggregate lead for granted is a foolish team. So I hope that Montella and the team are respectful and play to win. The most significant thing would be avoiding injuries, and it would be great to rotate some players to avoid early burnout (or the aforementioned injuries.) But Shkëndija have come this far for a reason, and I’m hoping they put up a good fight in their home country, because no one wants to see a rout. However if Milan play their cards right and stay focused, they can hold out for qualification into the Europa League group stage.